J2, a weak W.D. has moved into the upper regions of the sub-continent. As it is weak, precipitation is moderate in H.P, Kashmir, extreme north Pakistan. Will move away NE within a day. 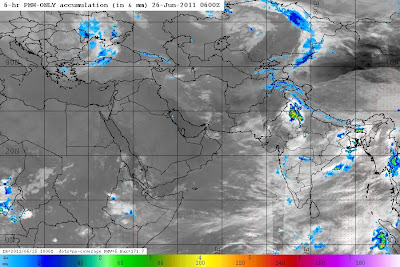 But, its inter-action with the monsoon axis and the embedded UAC (ex-BB1) has produced heavy rains in Punjab, Haryana and Delhi regions in the last 24 hrs. SWM moves into Punjab and North Rajasthan. We have to wait and observe whether the combined effects of J2 and ex-BB1 moves the axis northwards into position (1). If it does move further north, position (1), active rains along the axis and Nepal, but subdued rains south of the line. Position(1) is a "pucca" break monsoon scene. If the axis remains in the same position, rainfall can continue along the axis line. 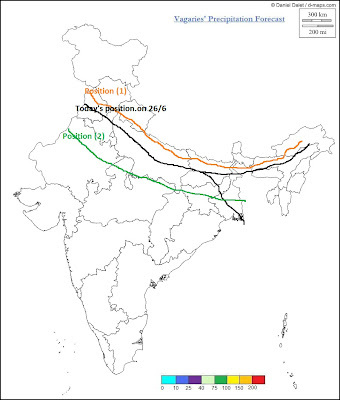 But, axis in positon(2) is not a break monsoon scene, and Central India/West coast and Northern peninsula can continue to get rains, though a bit subdued due to no systems present. Also, in this case, SWM can move further west into west Rajasthan. All the states in India have been receiving good amount of rainfall except Gujarat state.Now tell me when the Gujarat state will receive heavy showers?